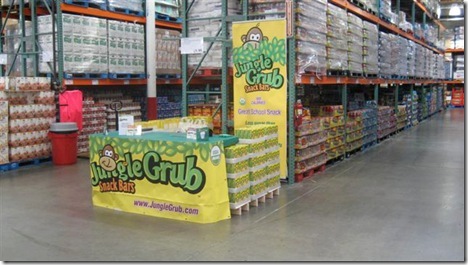 JungleGrub is Now in Costco! Now there is something to cheer about! Many of you know I have been assisting Steve and Teresa Brandt, the founders of Organic Nutrition mostly in the form of some gentle business cheerleading and encouragement as well as building the JungleGrub News Blog for them. Well through Steve's dedication and perseverance JungleGrub Snack Bars are now available a select COSTCO stores in Southern California (sorry to the rest of my national readership... although I'm sure Steve and "T" won't mind if you go to your local COSTCO manager and request they too begin to stock JungleGrub... just say'n). JungleGrub Snack Bars are the brain child of Steve and Teresa Brandt, two exceptionally brilliant and determined people! And these bars are AWESOME! What's so special about JungleGrub? Well, for starters... these bars were from the ground up created with kids in mind! That's why they are certified USDA organic. That means nothing has been genetically altered or fed growth hormones and of course grown without the use of pesticides. Bottom line - its straight forward food. When you see the USDA logo it should put you at ease that you won’t find things like High Fructose Corn Syrup in the ingredients. And unlike other nutritional snack bars these do not taste like the bottom of your Gym Shoe with the texture of a Roofing Shingle! No! JungleGrub is sweet, fruity, appetizing and best of all easy to eat! When you bite into a JungleGrub you can actually sink your teeth into one... you don't have to take out insurance on your teeth as you try to visegrip your way through them! 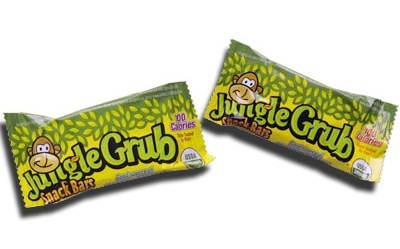 The other cool thing about JungleGrub is that each bar is currently only 100 calories! That equates to just 15 minutes bowling, 30 minutes playing Frisbee, 18 minutes golfing or playing 13 hands of cards. More importantly these bars help you accomplish these types of activities rather than require these types of activities! So if you happen to live in So Cal and want to try some of these outstanding bars for yourself, or get some for your kids... BTW... They are great Lunchbox stuffers and Gym Bag stuffers for those of you pursuing your New Year's Resolutions!... Just head on down to your closest Costco on the date listed below and visit the JungleGrub Endcap! You could even meet Steve and "T"! PLEASE COME AND INVITE YOUR FRIENDS TO BUY PRODUCT AND SUPPORT THE EVENTS! For those of you not in SoCal, JungleGub is also available on Amazon.com [LINK]. BEER... The Cause and Cure to All My Problems!... Or Maybe More Cure Now!!!! Hat Tip to Tommy on this one... from BBC News awhile ago but bears repeating. 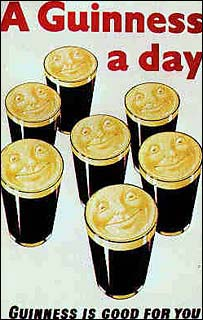 ...A pint of the black stuff a day may work as well as an aspirin to prevent heart clots that raise the risk of heart attacks. ...The Wisconsin team tested the health-giving properties of stout against lager by giving it to dogs who had narrowed arteries similar to those in heart disease. I know a few dogs that would have loved to sign up for that test! ...They believe that "antioxidant compounds" in the Guinness, similar to those found in certain fruits and vegetables, are responsible for the health benefits because they slow down the deposit of harmful cholesterol on the artery walls. So... 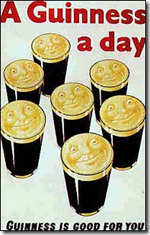 Even less reason to have any guilt about drinking a Pint of "Motor Oil" at your friendly neighborhood pub! And I know a few others who will... 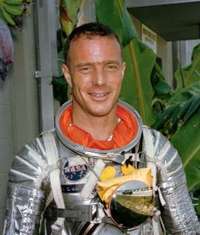 Stu?... Lex?... Tommy? Jungle Grub is Now in the Amazon! .com that is! That's right! You all remember my mention about JungleGrub right? If not, go here! Isn't it most appropriate that a product named "JUNGLE GRUB" is now available from the king of distribution and online retail "AMAZON!" Anyway, things are progressing wonderfully at Organic Nutrition, the parent of JungleGrub. Steve and Teresa Brandt just sent me an e-mail outlining what's happening and what's gunna be happening in the coming months. Trust me it is SUPER Exciting!!! Sorry I cannot divulge everything here, some is still company confidential... heheh amazingly enough I'm included in that circle! Nyah... Nyah.... I know a secret! But what is not a secret, and should be yelled from the highest of our 14ers here in Colorado and even the 102 footer in Florida, is that Jungle Grub is now available on Amazon.com!!! This is a HUGE success for Jungle Grub! 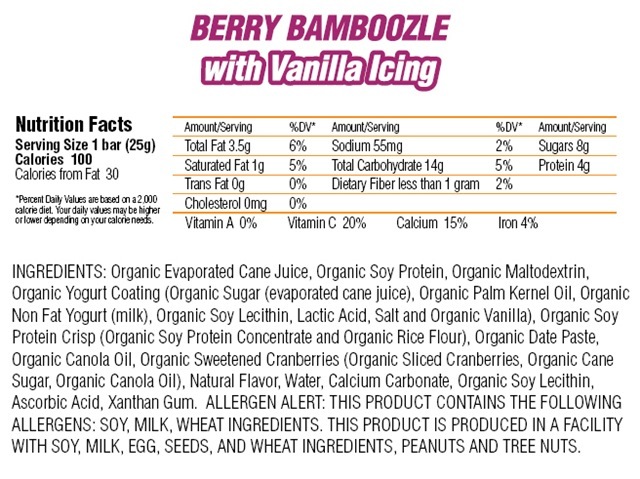 And should not be surprising to anyone who has tried either Berry Bamboozle or Peanut Butter Groove! 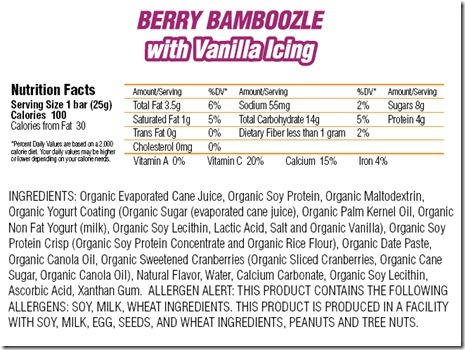 Well if you haven't tried either of these fine 100 calorie nutritious treats, you need to do yourself and your kids a favor... go here and buy yourself a box or 10! Also, be sure to leave your favorable comments on the Amazon site, it certainly helps! Having good product reviews on their website will help encourage people who have not had the opportunity to taste the bars (poor dears!) Taste is the most difficult feature to express in marketing a food product. Personal testimonials and recommendations provide people with 3rd party opinions and credibility. So get to work! Way to go Steve and "T"!!!! Uh.... What the..... Marketeering Gone Nutty? 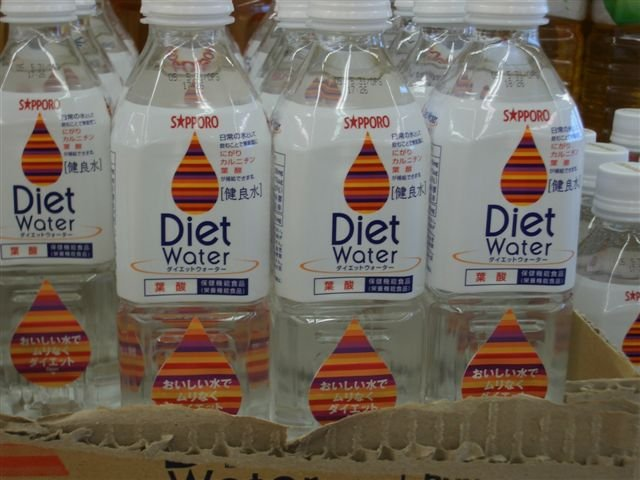 This is what happens when you let "Marketing" run "Product Development!" To Ensure Your Banana Will Be Protected! This is a real product! But, Oh God! was I having troubles reading through my tear filled, laughing eyes! These are just two pages from their website! Oh the places you can go! And now you can take your banana with you! In Colorful Style! It's ventilated! 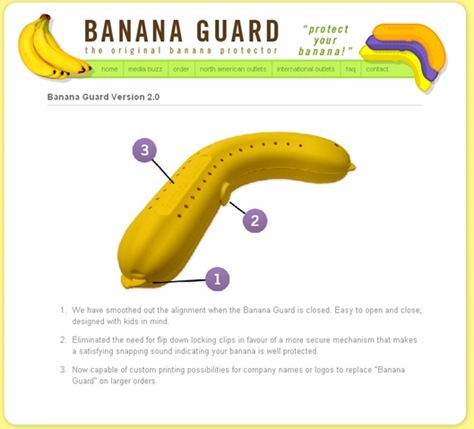 Q: "Not all bananas are the same size or shape, so how can the Banana Guard fit them all?" 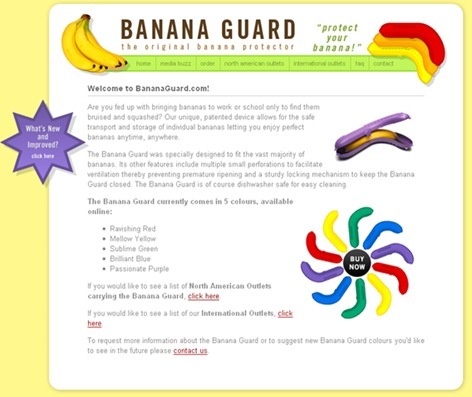 A: The Banana Guard was specially designed to accommodate the majority of banana sizes. Our testing indicates that over 90% of commercially available bananas will fit into the Banana Guard. Highly curved bananas can be straightened ever-so-slightly without harm to fit the Banana Guard shape. The opposite holds true of very straight bananas. Working at NewsGator, I am surrounded by creative people... Being in a Web 2.0 Software company will promote that type of person. 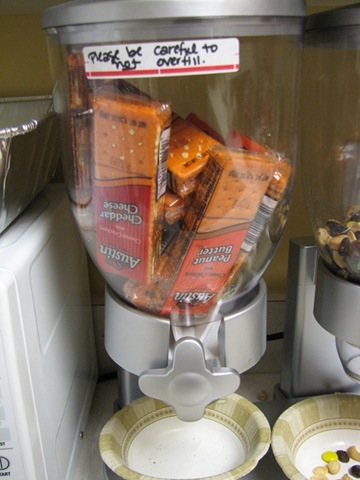 However, I have to say that I was caught off guard by one of our employees' creativity in the break room. You see we're one of those cool companies that provides free fattening agents snacks for our folks. 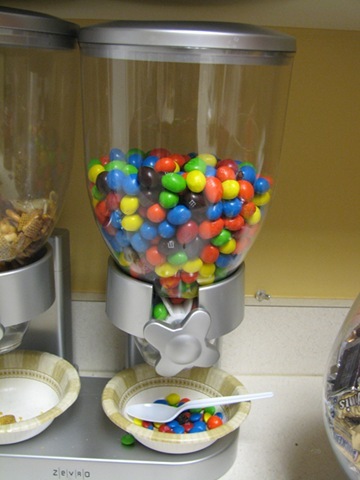 These nutritional goodies include M&M's (peanut doncha know!) 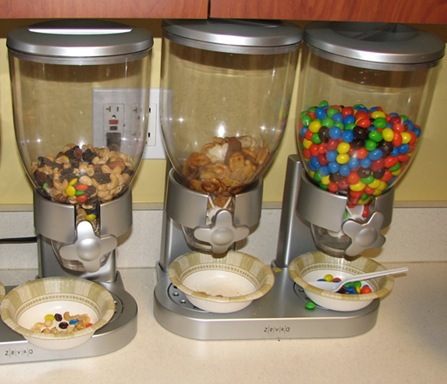 Bowls of Snickers bars, Red Vines, Pop-tarts etc... you know good wholesome food to help creative minds bloom! Cheese and Crackers... or if you're lucky Peanut Butter and Crackers! Aaaahhh NewsGator... breaking the daily monotony with a sledge hammer! Anyway I thought I'd let Steve explain JungleGrub for himself. Everyone: Bring a hat ! RSVP's will be necessary for Saturday night and Sunday morning. So plan your Cross Countries accordingly, and plan to have a good time! If you have any interest in joining the Tailhook Association (you need not be an Aviator... just have a dedicated interest in Tactical Naval Aviation) please leave me a comment here and I will be glad to provide more details of the Quality Organization Tailhook is Today! Or you are welcomed to visit the Tailhook Association's Main page [here] or their Daily Briefing [here].